Mordian 7th Regiment: 40k Adeptus Mechanicus - Army underway! Sadly my main cogitator has been handed over to some specialist magos for rehabilitation, as my dabbling in tech-heresy (thou shalt not attempt to improve upon the workings of the machine) has once again proven near-fatal to the device. So, one-picture posts it is for a little while longer! 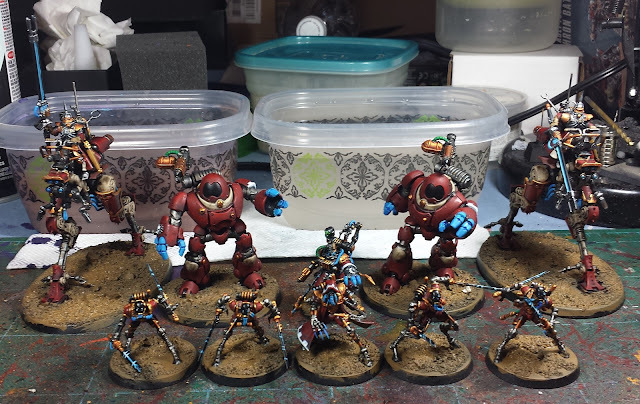 I'd decided to take a little break from the tidal wave of yellow and settled in for a nice protracted ad-mech build session, where I knocked together a pair of dragoons, a unit of ruststalkers and a box of the kastellan robots. ...Then jumped right in to getting paint on 'em! Without my main distraction machine around, I've been getting in a good amount of brush time, and have essentially been batch painting the lot! Still a ways to go yet, but they're coming along nicely so far. Really been digging the look of the new GW sculpts overall, and for the first time in years I'm finding that in many cases I actually prefer the GW aesthetic to FW's take on the Mechanicum - the Robots being the main exception, the FW versions have been phenomenal while the GW ones leave me a little cold. They're not bad by any means (and I feel they're much better in person than they seem in photographs), but the Castellax and Vorax are just light-years better sculpts. The Skitarii as basic troops are far nicer models than the tech thralls (granted, the thralls should be less menacing being armed rabble), and the upcoming magos model in the GW line I find far cooler than the slug magos on the FW side. It's cool and creepy, but just doesn't grab me. When all is said and done, I think there's room for both - they're intended to be radically different things and as a long time servant of the Machine God I'm ecstatic that for the first time in 30 years not only are there official models now, but there's two danged armies worth of 'em! Hah! You really don't muck about mate, these look great! Sorry to hear about the computer troubles, but as you said, without its distraction its easy to see how much more we would get done! Holy crap mate - oh you know, just sat down to dabble and WHAM, here's a whole mass of cool stuff painted! The red and blue go off well together - really digging that. I believe cheating is what they call it - that much paint in so little time. I think we need to figure out which devil you made a deal with. Impressive as always. I actually quite like the robots, they need a bit of converting though, but overall they are pretty cool. Great poses on the robots, and I really think your blues and brass elements work really well with the Admech scheme and aesthetic. Fast and good! My goodness! The robots look so much better with the black face plates. I think I'd like to see a bit more variance in those claw blues though. They are are a bit too singular colored. (Of course you are probably still working away). I would like to request a time lapse video at some point to see this speed in action! Still not a fan of the mech aesthetic, but those do look menacing all together like that! @Zzzzzz: Haha! Had to change gears, but still feeling the painting mojo. @Dave Weston: Thanks! Aye, the very static poses the studio went with definitely don't do the models any favors. There's quite a bit of posability in the kit, though less than their FW counterparts. @Zab: They're definitely polarizing models - I think the GW line is a little uneven sculpt-wise, though to be fair the same can be said about my feelings on the FW mechanicum as well. Still not totally sold on the dragoons, and the infiltrators aspect of the dual kit I straight up dislike. Really digging the new GW Magos, though! Really looking forward to seeing your take on the admech! Hope you manage to exorcise the malific presence! Nice job on these (ooooh Ruststalkers). I've been busy going through the Skitarii and Cult Mechanicus codexes and seeing what I need to rebase. I'll probably hold off on some of the newer kits until the retooling is complete. I'm kind of curious at to why you picked up the GW robots at all, since (and I agree) the FW ones are so much better. The Datasmith model is the best thing about that set. Was looking forward to your take on the new Admech and you haven't dissapointed mate. Very nicely done. @Phil Morris: Haha! Thanks man! @#2501: Cheers man! Mostly I just wanted the Datasmith model, and figured I'd at least see if the robots could be made to look a bit more dynamic. Overall they're not terrible, but they're not great. @Dai: Thanks bud! Plenty more to come!